Mikalojus Čiurlionis was a very quiet and dreamy man. Born in Lithuania, in 1875. He lived his life richly, but not for long – only 36 years. The musician and the artist in one person, he loved to work around the clock, although he constantly lacked the means for living. He perfectly finely and mentally felt the music. He was called the musical wizard. However, his compositions were not published and were rarely performed. Despite this, fame came to him only after his death. His music was lyrical, soft and colorful – dramatic. Folk melodies about the beauty of nature of native Lithuanian expanses flowed in it. She was so gorgeous that it seemed as if listening to her, pictorial paintings, appeared in the imagination in a real dimension. Composing music, he saw these landscapes with the “eyes” of his purest soul. They were so vividly imagined that the composer’s dream to transfer his visions to the canvas was obsessive. His talent for painting revealed unexpectedly. Deciding for himself that no one else would so accurately convey all the subtleties of the senses, he began to learn this art. The picture “Friendship” in 1906, the artist dedicated to his faithful friend and sincere admirer of his talents – Broneslav Wolman. 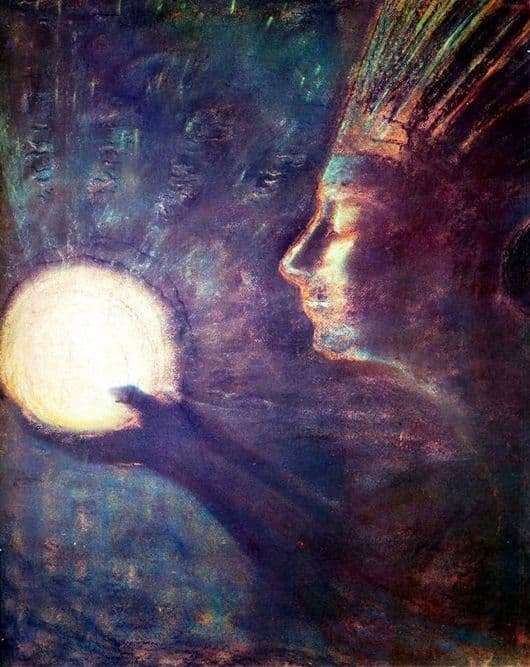 She helped Mikalojus a lot, including, and saved her several times from death. An unearthly beauty envelops the entire canvas, and as if there is no other magical space in the whole world. The Light of the Soul is freed from the shackles and recalls Love and Friendship – a part of the serenity and greatness of the heavenly forces. I remember that there is a dreamland in the world of dreams, where all intended desires are fulfilled, only good and sincere people are around. The sorceress from the picture expresses her love, as the most precious thing she has. She is ready to give it to everyone, through the light that radiates from her soul – and this is subject to every person. After all, everything around is happening in unison of the Light emanating from its Soul.